As reported by UK Poker News on 29th December, MANSION Poker has introduced the very first opportunity for its players to play for a guaranteed $100,000 in a tournament every day of the week, every week this month! The inaugural tournament took place earlier today, UK time, at 03.00GMT and resulted in the $100,000 prize pool offering a massive $52,690 overlay! This was fought over by under 500 players, giving everyone who played a realistic chance of cashing in what was effectively a huge cash giveaway by MANSION. The winner was a player calling himself kuj0 who won a worthwhile $24,000 for his $100 buy-in. This accomplishment took him less than five hours. This would give a UK player a great excuse to knock up a giant fry-up for breakfast and not feel guilty about it! kuj0 made good use of a big chip lead when he finally went heads-up against rkruok, and took him out in six hands. In the final hand, the chips went in after the flop of 9h 2s 7c, with rkruok (who held 10c 8h) on an open-ended straight draw. The turn and river cards , didn't help and kuj0 won with his pair of sixes. No less than fifty-four players shared in the $100,000 prize pool, with 54th place receiving more than double the $100 buy-in, pocketing a very decent $250 way down the field. "The response to the first of our $100,000 Guaranteed Tournaments has been fantastic, but those that participate early stand to benefit the most from the offer. We expect the momentum will build and tournament numbers to swell throughout January, as more players recognise that there is real value to be found at MANSION Poker." 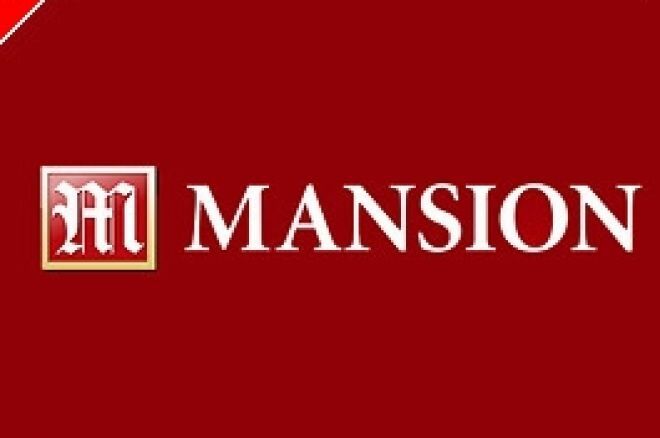 MANSION says that it is entering 2007 committed to providing premium player value, richer prize pools and higher profile action every day with the introduction of the $100,000 Guaranteed Poker Tournaments. To play in the $100,000 Guaranteed daily events at MANSION, you can buy-in directly for $100, or enter via low limit buy-in satellites, commencing each day from 14:00GMT and scheduled to start every two hours. Some are $10 Re-buy events and others $20 Freezeouts. There is also a last minute chance to qualify each day with a $20 Turbo Satellite at Midnight GMT. Ed note: To make the best of these stunning tournament overlays in January, download MANSION Poker right here. The next event is at 03.00 GMT tomorrow!